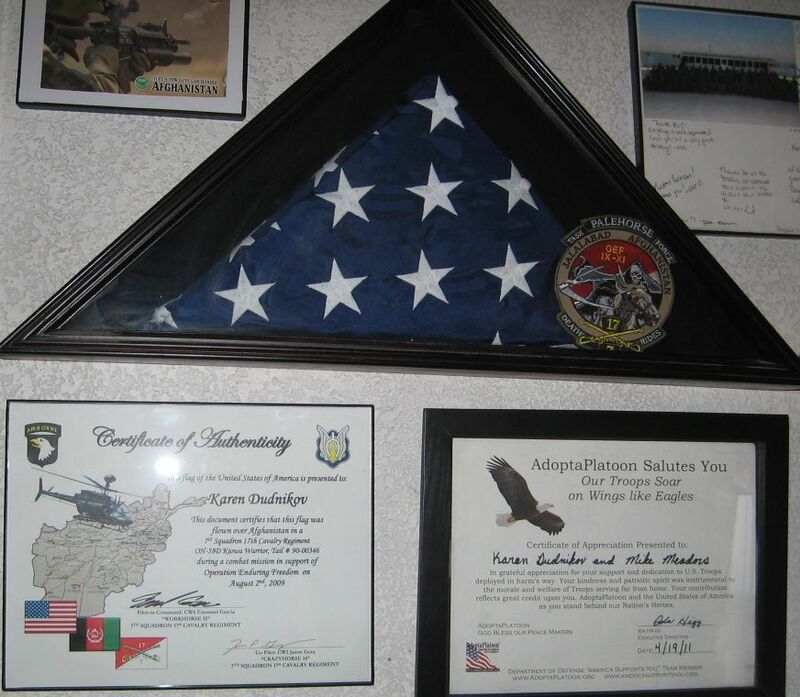 Our first American flag, has a certificate stating it was carried on a Kiowa helicopter during a combat mission on August 7, 2009, in Operation Enduring Freedom, by the 7th Squadron of the 17th Cavalry, 101st Airborne Division, Jalalabad, Afghanistan. In the corner of the flag frame is their special unit patch, "Death Rides", Task Force Pale Horse. This was the first item sent to us. To the right of that certificate, under the flag frame, is a letter from AdoptaPlatoon. Included inside the folded flag was a "Flag Certificate Information Sheet" showing a CW4 Emanuel Garcia as PIC and CW2 Jason Gosz as PI. Craft call sign was "Crazyhorse 14". "Brief Description Of Mission": Area recon & security in the Pech River Valley, Afghanistan. 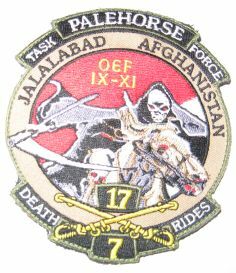 A closeup of the Palehorse Task Force patch is below the flag picture.